Helping GFL students to create their own podcasts is a popular activity. How should productive podcast work be approached, and what benefits can it offer? You can even find out for yourself in a podcast project of your own. Are you and your class brave enough to try something new? Do you enjoy using electronic media and digital devices? Then making your own podcasts would be an exciting Web 2.0 exercise for you to approach cooperatively in the classroom. The benefits are easy to see: learners choose a theme, write a script and turn it into a spoken piece. In the process they are practising all four skill areas and also their pronunciation. The result is a verbally-delivered product that can be presented in the public domain on the internet, depending on quality and interest. A podcast creation project starts by listening to samples on the internet as a group in order to motivate the learners. The clips on radiodaf and aleman creativo are just two to three minutes long and inspire students to produce their own. For teachers, academic texts on the potential of podcasts as well as the various options for using them receptively and productively in class are another good method of preparation (see Kluckhohn 2009, Stork 2012, Peuschel 2012). The themes come from the learners, or are oriented to the curriculum. Podcasts are suitable for a variety of lesson content covered in German lessons: at lower ability levels the students can introduce themselves to each other, or give a presentation of their course. Other podcast subjects might include the city, the family, work or their favourite leisure activities. Interviews and surveys for reports or short documentaries are of interest to those working at higher levels. Learners can use book or music commentaries, event reports or even staged conversations and simulated radio talk shows for their podcasts. You need a computer linked to the internet, recording equipment or smartphones and a (free) website for publication. Furthermore it is important to have good time management skills and a positive attitude to mistakes. High-ability groups can create a podcast in just a week with the right support. However it’s better to spend time on it and work through each step in succession. This enables students to utilise the potential of podcast creation more effectively and to take an active part in shaping the process from the initial idea to a successful listening experience for a global audience. The steps Write for your listeners and Record are especially important for working with a foreign language. First of all, learners draft a script. They use this script to prepare for the verbal piece. Doing this familiarises them with the differences between spoken and written German. Furthermore they learn to use writing as a tool to support speaking. Learners write, adjust and correct until the script serves as a good basis for the recording. The script they write themselves is the basis for the recording. | Photo (detail): © StockPhotoPro - Fotolia.com Recording is the core of a podcast project. It may be that the students have never heard their own voices in the new language before. A calm, confident and sensitive approach from the teacher, as well as positive feedback, are particularly important at this point. The teacher can also support narration and recording through language and rhythm games, or speaking exercises. The learners must be happy with the final result of the recording. At this point they can decide for themselves whether they would like to go public with their stories and their own voices, or not. If they are not planning to create their own podcast web page, the clips can be sent to radiodaf for publication. If the podcast is being presented on the internet, it is particularly important in the case of children to comply with privacy rights for online publications. Every country has their own legal requirements for this. In some cases it’s helpful to cooperate and leave the boundaries of the classroom in order to increase students’ motivation. Is there a local radio station in your town? Can the podcast work be linked with a studio visit? 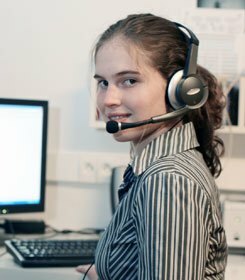 Is it possible to work together with German learners from other courses or classes for a podcast? A collaborative project with other German learners, a local radio channel or the school media centre is exciting. Through publication, practising becomes real participation in target-language discussions. The motivation to produce podcasts is derived from participation itself. Kluckhohn, Kim (2009): Podcasts im Sprachunterricht am Beispiel Deutsch. Berlin: Klett Sprachen. Peuschel, Kristina (2012): Lerner-Podcasts. Präsentationen aus dem projektorientierten Unterricht. In: Fremdsprache Deutsch. Issue 47, p. 30-34. Stork, Antje (2012): Podcasts im Fremdsprachenunterricht. Ein Überblick. In: Informationen Deutsch als Fremdsprache Volume 39, Issue 1, p. 3-16. Prof. Dr. Kristina Peuschel works as a junior professor for language-sensitive teaching at the University of Tübingen. Any questions about this article? Please write to us.